Nikola Vlasic stunned the European champions with a predatory roasting of World Cup winner Raphael Varane inside two minutes to tip a rocking Luzhniki into overdrive. Toni Kroos sent a wildly The Croatian was a man possessed from the first whistle, hounding Casemiro and Lucas Vazquez off the ball inside the first ten minutes as a powerful tempo proved too much for Julen Lopetegui’s men. An 80,000-capacity crowd of rabid CSKA supporters could barelykeep up with the energy set by their mean. Even after the initial burst of adrenalin had inevitably subsided, there we few signs of the natural order being re-established. When weak Fedor Chalov effort was cleared with Rodrigo Becao caught out of position, it was Ilzat Akhmetov who raced back to cover with a perfectly timed sliding tackle on Marco Asensio. The confidence almost cost the hosts just before the half-hour mark when Jaka Bijol was caught stretching for a ball. Casemiro snaffled up the pieces and suddenly found himself in acres of space with defenders back-pedalling. From around 20 yards out, he took his time, picked his spot and drilled a low effort against the outside of Igor Akinfeev’s right-hand post. Ever so gradually, as Los Merengues, gathered their composure, CSKA began to drop deeper. Chalov – much like his counterpart Karim Benzema – barely touched the ball as his midfield controlled what possession fell their way. Benzema himself had a quarter chance with ten minutes remaining in the first half that flew comfortably over from near the edge of the area. A few minutes later he tested Akinfeev’s reactions with a header at the far post, but the recently retired Russian legend palmed it away. Benzema was being starved of the kind of service he is used to with the pace of Bale and invention of Modric. His frustration led him to drop deeper after the break, and he blazed another loose shot over. Lopetegui responded by sending on the more energetic Mariano Diaz for Lucas Vazquez and Modric for Casemiro just before the hour mark. Quite apart from causing problems for CSKA’s defence, however, Diaz and Benzema simply couldn’t communicate or find their own space. Rodrigo Becao and Kirill Nababkin were rarely found troubled by the threat from out wide, leaving Nikita Chernov to sweep up what few scraps Benzema had to feed off. Modric was surprisingly absent from Real’s play; if anything, it was the inexperienced Ilzat Akhmetov who was more composed and disciplined. Alan Dzagoev was a willing runner but couldn’t last beyond 65 minutes when Dmitry Efremov was brought on in his stead. Within two minutes Efremov had darted down the left and whipped in a cross that teased past Chalov. His introduction allowed a more natural shape with Oblyakov moving to a more central position. 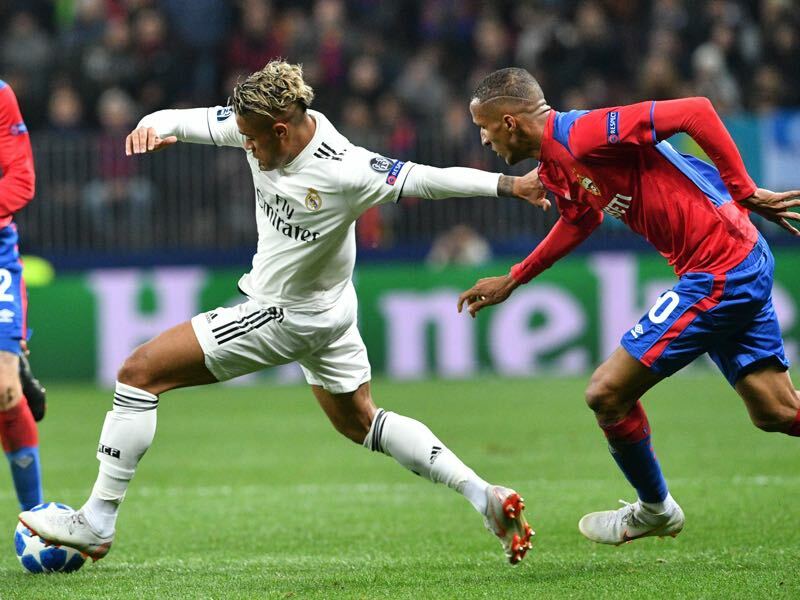 The pattern for the final part of the match was set; Real Madrid held the ball, and failed to penetrate a resolute CSKA. In the last minute of normal time Diaz nearly gifted an undeserved equalizer to the visitors with a flying header from Odriozola’s cross – again Akinfeev’s right post saved his blushes. 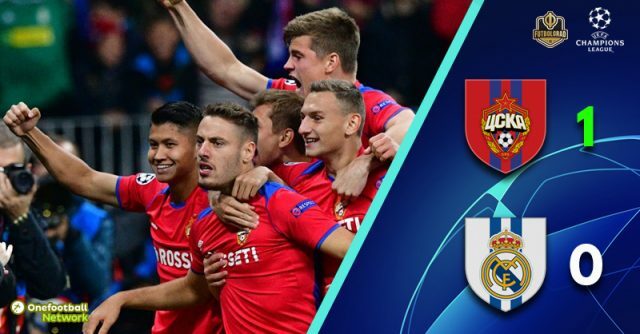 Despite a frantic added time period in which Akinfeev was sent off for two quickfire yellow cards, but CSKA held firm to pull off one of their greatest results in recent memory. Rodrigo Becao was immense on the right side of CSKA’s three-man backline. The Brazilian commanded the defence alongside Nikita Chernov and regular fullback Kirill Nababkin with the composure and intelligence of a European champion. Benzema’s frustrations were as much to do with Becao’s towering headers as the lack of service. The whole midfield unit were magnificent in their own right but were given the platform by Becao. Lopetegui chose not to start with the best player in the world or his fastest attacker, and it cost them. Gareth Bale was left back in Madrid along with Isco and Sergio Ramos – who scored twice in the Luzhniki for Spain against Russia a year ago – with the less dynamic Lucas Vazquez and Dani Ceballos in the starting lineup instead. The hammer blow by Vlasic may have come from a poor mistake, but an early goal could easily have come elsewhere given the lack of impetus provided by a lacklustre team selection.